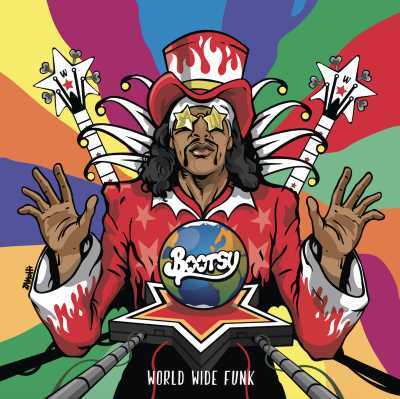 Bootsy Collins toasts to "Ladies' Nite" on the latest sample of his upcoming 14th LP, World Wide Funk. The synth-fueled track blends hip-hop swagger and funky rhythms, with cameo spots from BlvckSeeds, DJ-Quik and MC-Eiht. In the song's colorful video, an animated version of the iconic Funkadelic bassist drifts into outer space, grooves on a golf course, levitates over his bed and hangs out at everyday locales like a grocery store and laundromat. Last month, Collins announced World Wide Funk and issued the LP's lead single, "Worth My While," a cosmic slow-jam highlighted by his alternating wah-wah and fuzz-bass. The album, which follows 2011's Tha Funk Capital of the World, features a high-profile crew of guest stars, including rappers Doug E. Fresh, Big Daddy Kane, DJ Quik and Dru Down, experimental guitarist Buckethead, singer-songwriter Musiq Soulchild and bass guitar virtuosos Victor Wooten, Stanley Clarke and Manou Gallo.